Event on the Thames, in partnership with National Grid Grain LNG and Sanmar, celebrates latest addition to ten-strong London fleet In London, leading global towage operator Svitzer and key partners have today officially christened Svitzer Meridian as the latest and tenth vessel in its Port of London fleet. During a naming ceremony held on the River Thames with guests representing a variety of customers and partners - including vessel builder Sanmar - the 70 tonnes bollard pull Azimuth Tractor Drive (ATD) Svitzer Meridian was officially christened by representatives from multinational electricity and gas utility company National Grid Grain LNG, who are godparenting the vessel. Meridian, whose name was chosen to reflect Maritime Greenwich’s Prime Meridian longitude line - and Svitzer’s longstanding links with the local area - has been in operation at the Port of London since November 2018. Speaking on the event, Kasper Friis Nilaus, Managing Director, Europe, Svitzer, said: “At Svitzer, we understand how important it is to have strong links with the local community. That is why it is appropriate that our local employees have named Svitzer Meridian after such an important maritime and geographical landmark. Svitzer Meridian has been specifically designed to meet requirements in London and she is a welcome addition to our existing fleet in the port. I know she will excel, helmed by our 70 experienced members of crew based out of London. The Meridian will be providing best-in-class towage services to our diverse pool of customers including container lines, tankers, cruise ships and bulk carriers, as well as LNG vessels. “Recently, we have seen a significant increase in activity and volumes in the port of London, making it one of our busiest operations in Europe. Our team in London has capitalised on Svitzer’s global size and scale by quickly matching changing market demands and by utilising the flexibility of our fleet in neighbouring ports or on the continent. Moving assets between ports is a huge advantage”, he added. 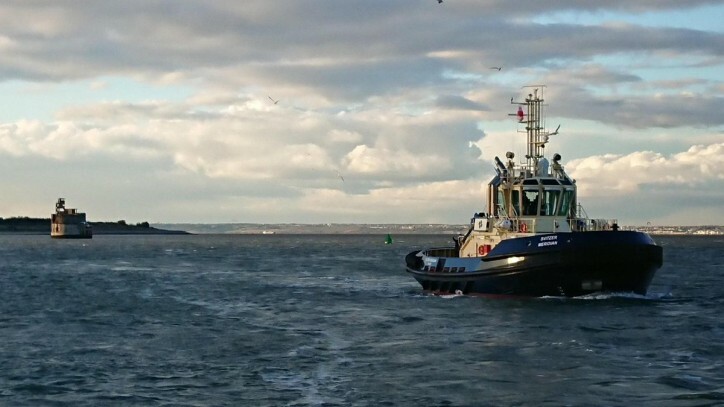 Exclusively commissioned by Sanmar from renowned Canadian tug designers Robert Allan Ltd, the main difference between tractor tugs and other types of towage vessels is the location of the propulsion units. As part of this new series, Svitzer Meridian has forward mounted Z-drives, whilst aft is a fixed skeg. Furthermore, and to accommodate operations ongoing throughout the Thames and in the Medway, Svitzer Meridian boasts firefighting capabilities alongside its exceptional manoeuvrability.